Per country, there are significant differences between the number of active participants planned and the number of participants actually reached. The Lebanon programme reached 33 percent more active participants than planned and almost 67,000 more children than in 2012, as operations were continuously scaled-up to support the growing number of Syrian refugee children. 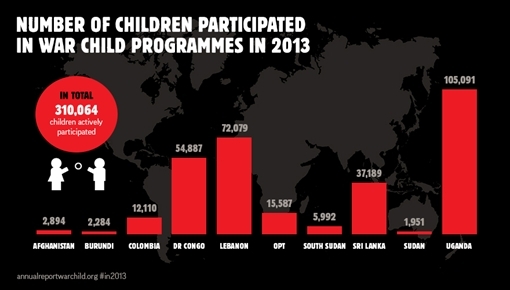 In Sudan, we reached 53 percent fewer active participants than planned and 34,000 fewer children than in 2012. This is largely due to the fact that most of our operations in Sudan could only start in November 2013, as our partners struggled to obtain the necessary permission from authorities to begin implementation.